The stories found below were sent in from parents and grandparents from around the United States. All the injuires are in date order. If you know of anyone who has a problem with this toy, please ask them to send in their story to our website. The stories on this page dated August 3, 2004 & April 7th, 2005 have photos that may be upsetting to some people. We felt it was important for people to see what this toy is doing to the children who have had it wrap around their necks. If you would prefer not to see the photos, but would like to still read the stories dated August 2004 and beyond, please email us and we will send you an email of the stories. March 15, 2003--E Bridgewater, MA--Just another horror story regarding yo yo balls. On 3/15 my daughter had the finger piece of the yo yo ball and I was holding the ball end. The finger piece let go and was a direct hit to my eye causing a hyphema to my left eye. A hyphema is a very serious eye injury leaving me blind in the eye for 10 days. I have since recovered my eyesight, with the exception of permanent pupil and drainage system damage. However, if my daughter had received the injury, doctors say she would have been hospitalized and sedated for 2 weeks. I was aware of the choking and toxic dangers of the yo yo ball, but would never have dreamt of such an injury. Whatever can be done, should be done to remove such items from being sold to children! March 23, 2003--Escatawpa, MS--ON MARCH 23 OF 2003 I HAD A BIRTHDAY PARTY FOR MY SON. THE GOODY BAGS FOR HIS GUEST ALL CONTAINED A WATER YOYO. SHORTLY AFTER HANDING OUT THE BAGS THE KIDS WENT OUTSIDE TO PLAY. MY BACK WAS TURNED TO THE KIDS WHEN I SAW A LOOK OF PANIC ON MY SISTERS FACE. WHEN I TURNED TO SEE I ALMOST PANICKED ALSO, THERE STOOD HER DAUGHTER IN TEARS. HER FACE WAS BEAT RED AND SHE COULD'NT SPEAK, A YOYO BALL WAS WRAPPED SO TIGHTLY AROUND HER NECK YOU COULD BARELY SEE IT. THANK GOODNESS MY DAD WAS THERE, HE REMOVED THE TOY FROM HE NECK AND TOSSED IT IN THE GARBAGE. AFTER GETTING OUR COMPOSURE BACK, WE GATHERED THE REST OF THE YOYO BALLS FROM THE OTHER KIDS AND GARBAGED THEM ALSO. THE KIDS DID'NT EVEN MIND AFTER WATCHING WHAT HAPPENED TO THERE FRIEND. April 2003--Fountain Hills, AZ--My 2 daughters were playing with the water yoyo. All of a sudden, the elastic snapped in 2, and ended up hitting one of my daughters right in the eye! Her eye immediately turned red, her vision was blurred, and off to the eye doctors we went. We were sent immediately to an eye specialist, who informed us that Lauren's iris had a tear in it. We spent the next 2 weeks in the eye doctors every day. She was put on several eye drop medications, one of which had to be administered every hour on the hour, and the other was administered 2 times a day. After 2 weeks, she was finally allowed to go back to school. She does have a permanent scar on her iris and we are just darn lucky she didn't lose sight in her eye. April 13, 2003--Appleton, WI--Our scare with the Water Yo-yo happened just over 2 years ago while my daughter was having her 5 year old birthday party. My daughter had been given a water yo yo as a gift. As soon as my step-father saw the toy, he said "that doesn't look safe". He continued to watch Lauren while she played with it wrapping it around her waist. Within minutes, the yo yo was wrapped around her neck, and she could not free herself. My stepfather saw instantly what happened and ran to help her. There was no way my daughter would have been able to free herself from the tightly wound yo yo. I am very thankful that a protective Grandpa would not take his eyes off his grandchild when he knew something wasn't right. I immediately called my friend (a nurse) who had given Lauren the yo yo and explained what happened. She was shocked. I then contacted the store that she bought the product from (Dollar Tree). The associate at the local store had said that they no longer had the yo-yo in stock (either they pulled them from the shelf or sold out). Within a week, I contacted the Consumer Protection Agency, and met with a representative. I thought I had done everything I could and haven't seen the yo yo in stores. I was wrong. Lisa Lipin contacted me and let me know that this product is still in stores and more kids are being injured. It shocks me that this is still on the market. Today Sunday, May 15th Lauren went to Funset Boulevard (a local indoor amusement park) with a friend and her parents. One of the big prizes for a child to win was the water yo yo. Yes, it's still out there! May 2003--Granger, IN--In May 2003, my then 5yr. 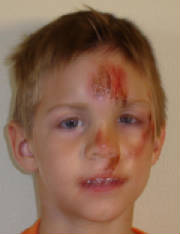 old son, Gavin was seriously injured by a yo-yo water ball. Being a curious boy, he stretched the ball about 10 feet as he walked into another room. The cord came free from what he thought was a secure place and struck him in the eye causing what is called a hyphema (blood behind the lens). Over the next few months, Gavin developed a cataract and required surgery to remove the cataract, and he also received a lens implant. He now needs to wear a bifocal lens in order to focus so he can learn to read. Gavin still receives medical treatment and remains under close supervision by his doctors. This toy is VERY DANGEROUS! I urge every parent to remove these toys from their home and to let other parents know of the dangers too so that they can protect their children from injury. It can happen in a literal blink of an eye. I was right there with my son yet I couldn't prevent it from happening. May 23, 2003--Mounds, OK--My husband coaches a 12 & under softball team when he was chalking the field watching Boo playing with a Yo-Yo Water ball. He was watching her play, chalking the field when 30 seconds later she was lying on the ground. She looked up at him, looking different. She moaned funny, he knew something was wrong. He picked her up and she was like a limp noodle in his arms. She was just about to pass out. Seeing her eyes roll back in her head. He commenced to taking the Yo-Yo off thats wrapped around her neck and hair. He unwrapped the cord 5-6 times from around her neck and hair, she started to respond gasping for air. She received bruises on her neck and her throat hurt for days. Her eyes were bloodshot, and the blood vessels broke out from around her eyes. Her ears were stopped up the rest of the night with a continued headache. She was going to play a ballgame on the other field which she didn't play that well, she acted incoherent. Luckily one of the coaches on the other team who is an RN checked her over and said watch her. As a parent and father it scared my husband so bad due to saving his baby's life he broke out in a cold sweat, nausea, and almost throwing up. That Monday I called the television stations and the connections with the Yo-Yo people whom didn't seem surprised. This toy or ? has to go before this happens to another child. Summer 2003--Rockford, IL--Last summer my 4yr old daughter was playing in the backyard with her water yo yo ball that was given to her as a gift. She was bouncing it and swinging it with her grandfather when he noticed she looked funny. As he got closer he saw her face changing to blue and realized the string was wrapped around her neck. He couldn't get it off with his finger as it was wound around so many times tightly and entangled in her long hair. Luckily he carries a picket knife and was able to cut is free from her neck. She had bruises on her neck for days. When I reported it to the CPSC someone came to my house and they listened to our story and told us at that time there were "a few" other cases like our own. Months later after speaking with Lisa Lipin I was shocked to know that there were over 100 at that time (now over 300). I am very disappointed that the CPSC continues to let children be hurt and tramatized by this toy because someone has not yet lost their life. Summer 2003--Schiller Park, IL--During the summer of 2003 I purchased the yo-yo water balls for my three children from a local flea market. The balls were unpackaged and there were no warning labels on the product. About 10 minutes after arriving home, my 7 year old daughter alerted me that her sister, 6 year old Chynnah, was having trouble breathing. I then found my 8 year old daughter having difficulty breathing and pointing to her neck at which time I saw the cord of the yo-yo water ball wrapped around her neck tightly. I attempted to remove with my hands, but I was unable to loosen its grip. I retrieved a scissors and then cut off the cord. My daughter suffered bruising about the neck, not to mention how traumatized she was. I further learned that while she was playing with the yo-yo water ball she was spinning the ball above her head when the cord suddently wrapped around her neck. I then contacted the CPSC to file a complaint. I was asked all the necessary information and was told my complaint was on file and if necessary someone would contact me. About a month went by and I was never contacted by CPSC. When I contacted CPSC they had no record of my complaint or name. They informed me that I would need to re-file my complaint. Obviously, my complaint was not important to them. I was shocked and angry! And then a miracle happened, Lisa Lipin, a mother and an advocate of banning the sale of yo-yo water balls was on Channel 5 News with her story. I was so happy knowing that the dangers of this product was made public so that others would become knowledgable about the dangers of this product. I also contacted Channel 5 News and my daughter also told her story to the public. I have read others stories and some of the horrible injuries that have been sustained because of this "toy". This "toy" should be banned before it causes anymore injuries. And I thank Lisa Lipin for her determination. I know she is making a difference along with all of us! Summer 2003--Palos Heights, IL--My son Dillon was playing with the Yo-Yo water toy at his grandmothers ( my mothers) house on a beautiful day in 2003. My 10 year old nephew had just purchased the toy at a local store, and he generously let 4 year old Dillon play with it in my mothers back yard. Dillon kept swinging the ball so that the rubber string wrapped around his body several times. Sometimes it would wrap around his waist and others around his chest. My mother sat on her deck watching him do this and didn't really think much of it, as it would quickly recoil. At some point my mother went into the house for a second, and when she came out Dillon was blue and falling to the ground. The yo-yo ball was wrapped several times around his little neck. My mother tried to pull it off, but it was so tight she could not even get her fingers under it. She yelled into the house for my 17 year old niece to get a scissors or knife. Thank got they managed to cut the rubber string in time to save Dillon's life. The only injury he was left with was broken blood vessels all the way around his neck. He and everyone who witnessed this horrible incident were very, very upset. My mother went up to the store with the cut up Yo-Yo Ball that very same day to warn them about this toy and beg them to remove it from the shelves. The sales woman at the store took the box and put it in the back room. I checked the store about three days later and the toy was back on the shelf. When I spoke to the store owner he said the toy was safe and it "wasn't meant for four year olds." If Dillon, at four years old, could swing that ball hard enough for it to wrap that tight, an older child could do the same or worse. I decided to check the package to contact the distributor because I wasn't going to get anywhere with this ignorant man. Unfortunately there was no distributor name or address on the package. I wrote the CPSC about the toy, and still it is sold everywhere. Thank you Lisa for your hard work and determination. I am absolutely certain you are saving children's lives. June 9, 2003--Columbus, OH--It was the end of the school year June 9, 2003, when I received a phone call on my cell phone from the principal of the Middle School my son Jacob (then age 13) attends that he sustained an eye injury and the school had just called an ambulance for his care. I was shocked, but since I was in my car and just one minute from the school's front door, I ran in and saw him sitting in the medical clinic with the principal shining a pen light into his right eye. He explained it was a serious eye injury (with which the paramedics agreed) and he needed medical care right away! I asked what would cause such an injury as I watched the blood rise up in his iris, and the staff said a yo-yo ball. I was familiar with the yo yo, but had never let my children purchase one because I had thought they were dangerous. I thanked the staff and decided to take Jacob to his pediatrician myself (located just down the street) and have her make a diagnosis. This in fact was a good decision, because she called ahead to Children's Hospital, where Jacob was immediately seen by an eye doctor instead of the emergency room staff. After examination and an eye ultrasound, Jacob was admitted to the hospital. He could not read the eye chart with his right eye and I was told he was temporarily blind in that eye and needed hospital care so it would not become permanent. I was crushed and tried not to be upset! He had a series of eye drops put in every few hours for the extent of his stay. He was admitted Monday, June 9 and was discharged the afternoon of Wednesday, June 11 with the stipulation he would do "nothing" at home. Any movement might cause bleeding again and cause permanent damage or blindness. In the hospital he was not allowed to move unless it was to use the bathroom. He was not allowed to read or play video games. He was not allowed to go to the teen activity room where other hospitalized teens mingled. He could watch a little TV, but became very bored. He was taken to the doctor's office in a wheel chair so he would not have to walk. He wanted to be home and was a little sad. July 2003--Lowell, MA--My son Justice (6 yrs old at the time) was playing in our backyard, with his older brother and some kids from the neigberhood, when his yo yo ball wrapped around his neck several times. He dropped to the ground and was gasping for air. The other children thought that he was playing and it wasn't until my older son (9 at the time) looked at his brother and his face was blue, and his legs were jumping up and down. My 15 year old neighbor removed it from his neck and she described his as unresponsive and she also stated that he was frothing at the mouth, his eyes were rolling back. She thought he was having a seizure. It took his about 20 minutes to get back to normal, he was very confused and not himself at all. He was admitted into the hospital for the night. His diagnosis was Near Strangulation. We were lucky. He was told that over and over how lucky he was. He had a subconjuctival hemmorage in his right eye. THat is how tight that cord wrapped around his neck. He had marks on his chest and back of his head and neck, he had marks around his neck for days. The marks went away but the tramu he (and his brother) suffered did not. He is still unsure about being away from me for too long and my older son has nightmares about losing his brother. My son almost died from this toy and if the CPSC does nothing about this, A child is will die from this toy, it is a matter of time. If Justice had that cord wrapped around for one more minute he would not be here today. It was not until Lisa Lipin contacted me did I realize how many children this has happened to. I just hope that this toy is taken of the market before someone does lose a child. July 22, 2003--Skokie, IL--My name is Lisa Lipin. I am the Chicago mother who has been working to get the yo-yo water ball banned for sale in the U.S. since July 2003. My son, Andrew, was injured on July 22, 2003 when the cord of his yo-yo ball wrapped around his neck 4 times cutting off his air supply. Thankfully, I was home at the time when Andrew ran to me for help. I pulled the cord up over Andrews face and head. He was left with strangulation marks around his neck for days and an experience that I'm sure that he will never forget. I am the person responsible for bringing this important safety issue to the public in Chicago through several news reports on NBC, ABC and FOX. Articles have also been written in the Chicago Tribune, Chicago Sun-Times, Skokie Review and the Washington Post. I have been working with IL Politicians for the last several months to get this toy banned. I met with Congresswoman Jan Schakowsky in December about my concerns. She has written several letters to Hal Stratton, Chairman of the CPSC urging that the yo-yo water ball be banned for sale. I also met with IL Senator Jeffrey Schoenberg and State Representative Elizabeth Coulson's Legislative Aid in January. They have since drafted a Resolution in IL which urges the CPSC to ban the toy and prohibits the sale in IL. Recently, U.S. Senator Richard Durbin (IL) has written to the CPSC about Andrew and the yo-yo water ball, again urging the CPSC to take action. In December, I requested copies of incident reports from the CPSC about children injured by the yo-yo water ball. I received some 86 reports and contacted over 50 parents across the country. I also searched the internet for all newspaper articles about children injured by the toy. This is how I came across the story about Tina Schreffler and her daughter, Cassadei. I called Tina to discuss my concerns about the yo-yo water ball and to let her know that I had been atively trying to get this toy banned for months. Tina gladly jumped on board with my campaign. Together, we are trying to save the lives of the children in our country. On March 9, 2004, I sent a letter to Hal Stratton, Chairman of the CPSC urging him to take action in this matter. To date, I've received no response. Click on the link on this website to see my letter. I remain committed to getting this potentially deadly toy banned in the U.S. Someone must take action since our government refuses to protect our children from the yo-yo water ball! I urge you all to go to the link on this site and urge your Senators and Congressperson to take action. Please feel free to call me at (847)804-7000 anytime to discuss your concerns. August 2003--Deerfield, IL--One morning while I was at work, my son Sam who is 4 years old was playing with his Water YoYo Ball when it became tightly wrapped around his neck. Fortunately, he knew he needed help and went to get his mother in the next room. She said his face was bright red and could hear him struggling to breathe. She couldn't quickly untangle it so she grabbed the nearest scissors to cut it off and they both burst into tears. My wife then made calls to anyone she knew who might have encountered this "toy" to tell of the danger. She also went to the store to tell the manager what happened and asked for them to please stop selling it but the store continued to sell it anyway. We fear that another child and family will not be as fortunate as we were and cannot comprehend that it will take children to actually die before this product is removed from the market. August 2, 2003--Lewiston, ME--My wife purchased a YOYO Rainbow waterball, it is a waterfilled ball with a stretchy rubber tube with a loop in the end so you can use it as a yoyo. Our friends daughter was playing with it outside and when I went to get her for dinner, she was a blueish purple in color and couldn't speak. She only could point to her neck. I immediately tried to remove the toy but it was made of such a rubbery material that I couldn't. I had to bite through the tube that was strangling their daughter. After everything was calmed down we asked her how it happened. She was playing with the toy and the harder she through the ball the more the tube stretched, it made a circlular motion and kept wrapping several times around her neck. She was unable to breath and her circulation of blood and oxygen to her brain was cut off. This girl is 7 years old and the package states that it is "For ages 6+ years". These toys need to be removed from the shelves. October 2003--Danville, NH--We had just come home from vacation. Our 5-year-old son was playing with a water yo-yo in the driveway while we were unloading luggage from the car. My husband had made one trip into the house and went back out to the car for another load when he noticed our son had turned completely blue and had his water yo-yo wrapped tightly around his neck. Our son was completely panicked and unable to breathe. My husband tried desperately to get his fingers between our son's neck and the chord, but found it extremely difficult. There was no time to find a pair of scissors, and my husband knew he had no other choice than to get his fingers between his neck and the chord. He somehow managed to do it and pull it away just barely enough to allow our son some air, but he cannot emphasize enough how difficult this was for him to do! He waited until the color came back into our son's face before trying to unwrap that horrible toy from his neck. Our son was so shaken up and so was my husband! My husband said he will never forget the look on our son's face when he couldn't breathe. It scares us to think that if my husband hadn't gone back outside when he did, we would have found our son dead in the driveway! This toy should be banned and I am disgusted that the USCPSC isn't taking this seriously enough! Some poor family is going to have to suffer the death of their child before action is taken and how pathetic that it could have been prevented! I don't feel like the USCPSC is doing enough and/or that they need to re-evaluate their standards for safety. October 8, 2003--Lebanon, OH--On October 8,2003 my grandmother purchased a shirt from Sears that came with a free yo-yo waterball toy attached to it. Naturally when she brought it over for my son, he wanted to play with the toy. I was outside painting the garage while he played with it in the driveway. All at once there was a loud thud that sounded like someone had dropped a melon. I looked up to find my son lying flat on his back. I called to him and when he did not answer I ran over to find him just beginning to open his eyes and this toy wrapped around his neck. I ripped the toy off and picked him up just in time to see the back of his head underneath the skin fill with blood. Having no experience with head injuries, I phoned my pediatrician who advised me to take him to the hospital. In the emergency room, the doctors informed me that he had fractured his skull and given himself a concussion. We spent the night in the hospital and the next week holed up in the house in total darkness. Bright lights and loud noises would of course, bring on yet another headache. This eventually stopped but what I did not realize is that the part of the head/brain that was injured is the part that controls impulse control. Whatever little impulse control my four year old had at the time was a thing of the past. He started becoming violent, throwing things, hitting and biting. Several times he had to be picked up from school for his behavior. It has taken several months and a mountain of patience but he is getting better. The headaches come and go but now instead of everyday he may have one once a month, but has been a long process. I'm glad someone is trying to get this toy pulled. October 28, 2003--Cincinnati, OH--My name is Missy Mason. My son Austin is 4 years old and October 28, 2003 turned out to be the worst day of my life, all due to a toy called the YO Yo Waterball. My son was stretching the yo yo when it snapped back and hit him directly in his right eye. Immediatley I could see blood on the iris of his eye and when I called his pediatrician she told me to get him to the hospital right away. I called 911 and by the time we arrived at the hospital the entire color part of his eye was black. At first we were told it was a hyphema which was pretty common in children, to take him home and not alllow him to do alot of moving around because the bleeding could get worse from activity. We were to make an appointment with a specialist in the morning. That day we were told we needed to prepare ourselves because with this severe of an injury he would most likely be blind in that eye. As any parent can imagine I don't think I need to even explain the devistation my husband and I felt. All I could think of was "all of this because of a toy"? I just could not grasp that in my mind. For eleven days straight we had to go to the Doctor every day because his injury was so severe and getting worse. On that Saturday we met with a Doctor, who my husband and I feel is the man we owe everything to. He wanted to do surgery immediatley to remove a large cataract that had formed and because the impact of the toy was so severe the entire lens of his eye had literally burst requiring Austin to have a lens implant put in his eye. Austin had surgery on that Wednsday and a second surgery the next day to check everything. After the surgery Austin developed traumatic glaucoma due to his injury. His pressure got so high the doctor thought another very risky surgery might be the only answer. Luckily we found a eye drop that helped and we got his pressure under control. During all of this time I was required to put about 13 drops on my sons eye throughout the day and some were every hour. Keeping in mind that my son is only 4 years old and getting drops in the eye of a 4 year old especially an injured eye was to say the least very stessful. On 12/2/2003 I remember writing down that in 36 days my son has 24 doctor visits and 2 surgeries. After that we continued to see the two doctors on a regular basis. As of today thankfully with the help of glasses, that he will have to wear for the rest of his life, he is able to see out of his eye. Everyday we are still dealing with the effect of that toy physically and mentally. Austin is seen by doctors on a regular basis and everyday we are still required to do 3 drops a day and 2 hours of patching that eye so he does not develop Amplyophia which is "lazy eye". I remember before Austin had surgery talking with a doctor who was very blunt when we asked about the future of our son's eye she said "Even if we can get back his vision your son's will always be prone for different kinds of problems and suseptable to many different eye diseases. He will deal with this for the rest of his life. His eye will never be that of a healthy eye again leaving the future very uncertain". The bottom line is "MY SON'S LIFE WILL NEVER BE THE SAME". Fifty years from now my son will still be dealing with this. Like I said we still don't know what even the immediate future holds which is very scary. Things have just calmed down enough in our lives that I wanted to see what I can do about banning these so called "toys". I happened to come across this web-site just a couple weekends ago and when I did I actually started crying because I felt like I was going to finally going to be able to get some help with how to go about banning this toy. On Monday I contacted the CPSC which was to say the least a very disapointing conversation and I hung up in tears feeling they could have cared less. I have since spoken to Lisa and she is being a wonderful help to me. It is so nice to know that there are other people out there who are working to get this toy banned. Unfortunatley because of the extent of my son's injury I am just now able to start in the fight to get these banned, but its nice to know the whole time I was going through this there were people out there trying to make a difference so this does not happen again. I read somewhere that the CPSC was not aware of any lasting injuries or injuries with any long term affects so I have to make sure my story gets out there. Everytime I look at my son in his glasses and look into his eyes and see the lens implant glaring back at me its a constant reminder of this toy. Something has to be done!! In Ohio the toy seems to be making a come back because stores that use to not sell them are selling it again. I physically get sick everytime I see one of them in the store. The most heartbreaking this to me is when my son comes running up to me in a store with a Yo Yo ball in his hand to show his mommy that they are selling this toy and in my little boys words "Mommy you better tell some one about this so no other little kid gets hurt like me." How am I suppose to respond to that. This toy hurt him and so many others and it is still being sold. What is the CPSC thinking? I will fight to do whatever I have to do to get this toy banned. Thanks for reading this I know its a bit long but I feel it is all so important. As for the CPSC I hope all of them can sleep well at night knowing that something they could have done something about and they have not will have a lasting effect on out life. Hopefully they will come to there senses soon before soething else happens and knowing how dangerous this toy is if they don't it will. November 22, 2003--Pennsburg, PA--My 7 yr old daughter was playing with the water yo-yo in our front yard which my husband and some family members and myself were out there also. She was spinning the yo yo around and the yo yo wrapped around her neck several times. She immediately put her little hand between her neck and the yo yo. My husband had to cut it off with a pocket knife. It also was tangled in her hair which was very difficult to remove. I thank god every day I was outside to be there for her. July 2004--California, MD--I am horrified, to see so many children hurt by these toys. My son was one of these children last year, i had just bought him one. He was playing in the house with it and i was out side on the deck with my mother in-law, a few min later my son had the sense to come and look for me. He stood there in front of me and for a few seconds i just looked at him, not realizing, what was going on. You see by this time he couldn't talk, and was starting to go blue, i had to wedge my fingers in between his neck and the toy so he could get some air i have never been so scared for him and angry at myself for buying such a stupid and lethal toy. The photo seen above is of Mary's neck. April 7, 2005--Pittsville, WI--(Photo below)--On April 7th, 2005 my son was playing with one of the water fill yo yo balls. It is a very popular toy. He was swinging it around and some how it went around his neck which cut off his blood supply and he passout and fell head first on the ground. I am unsure how long he was out. He landed on the concrete. I heard him call for me and I walked out to find him all bloody with the cord still wraped around his neck. He had contusions around his neck. He does not remember the accident. We rushed him to the ER and they could not beleive what happend. He had a CT of the head and an EKG done. Which thank god both came back normal. They wanted to keep him overnight, but it was his 7 b-day and his golden at that and we thought he was doing fine. They let us go home. The next day we went in for a follow-up and had a caroid artery scan done and again thank god it was normal. He is doing ok at this time and the black eyes and abrasion are healing. I just wanted to share this with everyone to make you aware what can happen. I received a call from the ER doctor and he said that their has been over 200 cases of strangulation and injuries with these water filled yo-yo balls. I did check the Consumer product recall and they have not pulled them off the market. I did report it to them and thank god I have been assigned an investigator to come and talk with us about this accident. Again I just wanted to share my story as a mom so you will be aware of the dangers so you will not have to go through what we have. April 17, 2005--Austin, TX--My son had the Orbit Ball water yoyo. The one w\ three balls on it instead of one.He was squezzing one ball in each hand laughing last night and one burst and shot right into his mouth. This is a three year old, so you can imagine he couldn't have applied much force on the ball, yet it exploded. I called poison control after rinsing his mouth out numerous times. Poison control had no information for me and couldn't tell me if the contents were toxic. Neither could my pediatrician who simply recommended giving him milk to coat his stomach and to "watch him for signs of poisoning". My husband and I searched the internet and found conflicting information. Some said the balls weren't toxic, others said they were. I was horrified at finding the numerous stories of near strangulation! I had no idea it was so dangerous. I wanted to be sure to share that the balls can break and leak in addition to the possible strangulation. I hope Lisa has luck in banning this toy everywhere. I know I'll certainly share my story and the ones I've read here w\ anyone I see w\ a water yoyo or at any store who sells them. Good luck Lisa! July 31, 2005--Kansas City, MO--The following is a terrible experience my 3 1/2 year old, Carlie had with this hazardous toy....I only hope it does not take a death to get it OFF the market! I was upstairs getting dressed and luckily heard her whimpering downstairs. I ran down to find her with her "yo-yo noodle ball" wrapped tightly around her neck. Her face was maroon and she couldn't breathe. As soon as I got it off of her and we calmed down, she told me she was not able to speak to call me for help (while her neck was wrapped). She had a bright red line all the way around her neck. This item is extremely stretchy and gummy. As she tried to get it off, I assume she was just pulling it tighter and tighter. I shudder to think what the outcome would have been if I had not been lucky enough to hear the little noise she was making. I would like to get the word out. It is imparitive that every single one of these be pulled from the shelves. Not only do they pose a risk for strangulation, but I can see now that they could very easily snap back a cause an eye injury as well. August 2005--Winslow, IN--At Bible school this summer, my niece received a light up yoyo ball. She brought it to my house where I have a twelve month old son. He loved to play with it. One day, I seen him chewing on something. I dug a small battery out of his mouth. I had no idea where he could have gotten this small battery. My husband came home with the latest issue of Consumer Reports. While he was reading it, he told me to look at this article about this yoyo ball. He told me to throw the toy away before something happened. I got to thinking, and I looked at the ball. Sure enough, the rubbery material had split open and the inside ball had came out. The batteries were loose and falling out. Thank goodness I was right there and he didn't swallow or choke on the battery. I see how dangerous this toy is and I would like to see it pulled off every shelf in the world! August 2005--Albuquerque, NM--I'm a 34-year-old adult and quite safety-conscious, not the sort of person one would expect to be injured by a rubber toy popular among 5-year-olds. I was playing with a Water Yo-Yo belonging to a neighbor's 13-year-old daughter over the summer, spinning it forcefully over my head. The rubber string suddenly snapped off right at the ball, sending the ball flying across the yard. The piece remaining in my hand recoiled so hard it bruised my cheek severely, knocked my glasses off, and knocked me to the ground. If I hadn't been wearing my glasses, the end could easily have hit me in the eye hard enough to blind me. If my glasses were not of the impact-certified safety variety, they might have shattered and dealt me a serious eye injury. It felt like I'd been punched in the face. Hard. When I picked myself up and went to retrieve the ball end, I discovered my neighbor's dog (admittedly not the smartest canine I've run across) in the process of trying to swallow it. The poor animal could easily have choked. A toy capable of causing serious injury to an adult and choking a pet should obviously not be in the hands of small children, and since that seems to be the primary market for these balls, they should certainly be banned. It occurs to me after reading the accounts on this site, that an adult could be strangled by the cord just as easily as a child. If the cord wrapped itself tightly enough, even a grown man like myself might not be able to remove it in time to prevent unconsciousness and death. October 28, 2006--Washington State--I found your website today as I was looking for information about the yo-yo water ball. My five year old son was playing at a party last night with a yo-yo ball, given to him as a party favor. The ball got wrapped three times around his neck and he was suffocating. He was turning blue and his eyes were bloodshot and watering. He was struggling to remove it and had a panicked and scared look on his little face. I had to break it off his neck, which was very hard to do. I did not know the danger of this toy and after doing research about it today on the internet, I found that this problem is very common. I would like to know the status on banning this dangerous toy from our country. I sent a letter to my congressmen today asking for his support and I would like to know if there is anything I can do to help your cause. I live in Washington state. Please let me know what I can do and thank you for your effort to get rid of this dangerous toy.